A Cancer Doctor From The U.S. 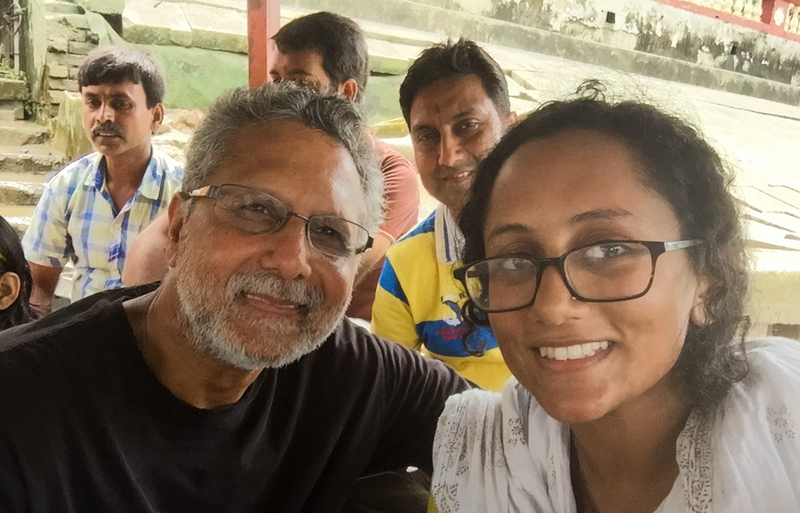 Learns Valuable Lessons Treating The Poor In India : Goats and Soda Journalist Ankita Rao asked her father, a doctor, to spend time with her in India, volunteering at a medical clinic. Then she interviewed him about the experience. 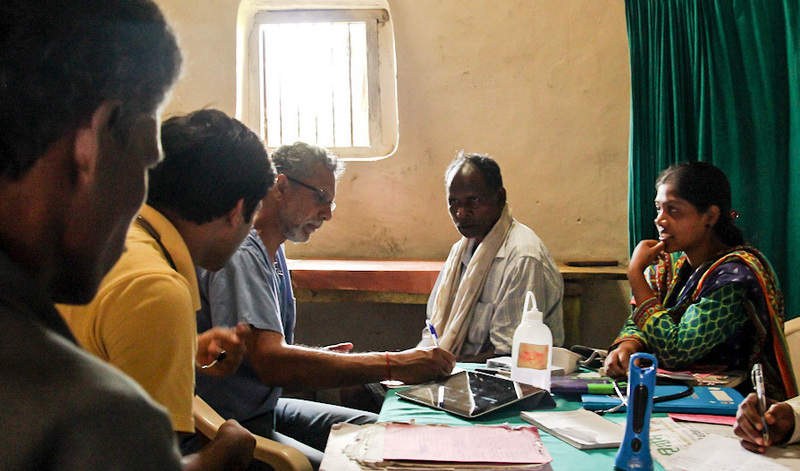 Dr. Raju Rao, in glasses, during his volunteer stint in India. A couple of months ago, I asked my physician father Raju Rao to visit the the area in India where I was working as a journalist covering health and gender. I wanted him to see Jan Swasthya Sahyog (JSS), a health organization started by five doctors in Chhattisgarh, one of the poorest states in India, to provide services to rural and tribal communities far from mainstream health care. I had visited their rural hospital twice before for various assignments and found their approach to health immensely fascinating and effective. I arranged for my dad, a 57-year-old hematologist oncologist (blood and cancer) doctor in Florida, to volunteer with the clinic for a week while I did some research. My dad was born in India and had visited many times but not somewhere so off-the-grid. And he had never practiced medicine outside the U.S. It was something he had never done, in a place he couldn't even imagine. The author and her father. What follows is a conversation we had after we returned. Before we got there, I remember you said you had some reservations, maybe nervousness, about going. Where do you think that came from? I'm used to practicing in a certain way. I have a day-to-day routine in a controlled environment. It's a very structured way of practicing medicine — the only variations are in the types of disorders you see. So the nervousness came from not knowing what to expect in a new atmosphere with a different setting, different climate, different people and the circumstances themselves. What was the first thing you noticed when we got to JSS in Ganiyari? I walked into an atmosphere where there were people outside, inside, on the lawns, laying on the ledges, inside the building. It was just teeming with a mass of people. My nervousness was confirmed and heightened — it was far more than what I expected to see. At the same time, the simplicity and spartan environment was striking. In a sense, overwhelming. What's the difference between the patients you saw at JSS and the ones you see in Florida? The immediate difference is that the majority of these people are very thin. You can see their bones, and anything abnormal is readily visible. And they are completely reliant on the physician — whatever the doctor says is final, no questions asked. In the U.S., the average age of my patients is 75, and many are overweight or obese. My patients also come armed with questions. They have researched, they have facts and figures. They expect a question and answer session and data. They want options. Did you notice anything about how the doctors interacted with patients? Is it different than back home? The immediate difference is a lack of technology. No one is staring at a computer — there's a pad and pen, there's a paper chart that's full of information. That's how we used to do things 10 years ago. What I noticed was that the interaction between the doctor and patient was not just direct, but in the presence of family, other families, other patients waiting outside, medical residents. All of this is taking place at the same time. You mentioned a spartan environment and lack of resources. What did you think about the quality of care in a place that doesn't have everything it may need? It's very human and very practical. Based on what is available, the physicians have figured out how to best treat the patients using guidelines that are in vogue today. They know state of the art medicine and they modify treatment plans based on what's available. There is a big constraint — there isn't always blood for blood transfusions, or what we call growth factors to help with low blood counts. They don't have many of the medications we use to prolong survival in some cases of lymphomas and cancers. But it's a really remarkable way of doing things in a community where there was absolutely no care just 20 or 25 years ago. I'm always amazed by the doctors at JSS. They were trained at the best medical schools in India and they're out there every day with no signs of exhaustion. What do you think drives them? You see the complete satisfaction in these physicians engaged in the day-to-day care of people who have no care at all. Without complaining, without frustration, without disappointment — the focus is always on what's possible and what needs to be done. I saw this happen day after day, so I knew it wasn't a sporadic thing. It's something engrained in these people. It occurred to me that the philosophy of the place is very Gandhian. For example, when you eat at the cafeteria, all the doctors, nurses and clerks eat together and everyone washed their own plate. Everyone eats their own food. That culture was created by the people who started the facility. You meet them and you understand why the place is the way it is. On the second day we went to Bhamni, which is a rural clinic on a remote tiger reserve that serves tribal people there. You've never been to a place like this — what was your reaction? That was my first experience and, at first sight, it's overwhelming. There's huts and thatched roofs. The place is packed — no electricity, so the majority of light comes from solar power. The pharmacy works out of a closet. The lab is set up in full view of everyone. Patients come in from 20 kilometers away on foot. Each case there was memorable. People came in without expectation. I had come expecting to see blood and cancer, but I realized the need in this area is so much you need to just do whatever is in front of you. I saw children, gynecological problems. It was a learning process — I was corrected in my assumptions and diagnoses, even by first-year medical residents. There was one kid you saw there that we couldn't forget. His eyes were almost swollen shut. When I saw him, my antenna went up. He was a 7-year-old with kidney failure. The feeling was that you see this sick child and all your resistances and reservations come down. You just want to hold that child and take care of him and make sure he gets well, all the while knowing this may or may not be possible. What's amazing is that they have a strategy in place. We made a treatment plan and, on the same day, they informed his father and mother he needed to come back to the JSS facility [the main hospital campus in Ganiyari]. They rode along with us when we went back — it was comforting to know that the pediatricians and JSS treated him. Things like that — like taking the patient back in our car — are always interesting because the need is so high and you can't do it for every single person. Is there a practical part of service that you learned from the people at JSS? When you're in that scenario, you change the way you see yourself. You're no longer a physician and they're no longer a patient. You just have a skill, and you have to find out what's off balance and do whatever is necessary. The hierarchy goes away, all those formalities — the conveniences of life fall away. You see a sick person and you take them and deliver them into the hands of someone who you know can provide care. All the middle stuff is out the door. It's something heartening to see because all the layers and functionalities can hinder care. I appreciated the directness of it. What gets in the way of that directness here? The one that immediately comes to mind is insurance and money issues. In a private practice, that's the first roadblock — even if someone like me is willing to see anyone who walks in the door, you can't ignore the financial aspect. Whether we like it or not, that influences the way — not necessarily how we treat the patient but what you can offer that person. I have to think of ways to get around the so-called system to make state of the art care available. And we've talked about how frustrated you are with doctors profiting off their patients, too. When you have so much available, when you can stand to profit from treatments, then its up to the physician to see what's appropriate. There are grey areas — like in the treatment of cancer, we don't know how people are going to tolerate treatment. It's up to us to apply what we think is in the best interest of the patient and there's a fine line between what's best for the patient and what's profitable. Sometimes it can be an ethical issue — you can profit from offering treatment instead of telling someone they might be better off without medical treatment and only medication to stay comfortable. You said a few times that working at JSS was the happiest you've been as a physician. I have satisfaction and happiness here as well, but over there I tapped into the original idea I had when I wanted to become a physician: to serve people who needed care. The experience just put me back in that mindset — it tapped into that deep sense of responsibility and caregiving. Now that you've come back, have you noticed any changes in the way you practice? I look at patients slightly differently. I always thought I took care of people well, but now I spend more time with each person and don't pay as much attention to the business end of the practice. I pay more attention to the feelings of the people, and what they expect. And I'm more forthright in giving my opinion about what I think is best for them. It's the humanness. I'm not used to asking my parents this, but what are your plans for the future? I plan to do this every year. You can't get over the happiness of that place. It makes no sense — people are pumping water, sleeping on ledges. We're conditioned to think we have to have all these things and resources. Hopefully I'll get to go back more and more, spend more time there. The simplicity of the place, and the lives of people in that setting, it made me feel completely at home with the people, the environment. You become part of a movement with the action that was taking place there. It's a very beautiful feeling. You're just part of a whole.